I keep trying to come up with cute titles to entries like so many of you do, but I can’t seem to think of any. At any rate, I am showing that yes, I am indeed knitting and crocheting. Here is proof that progress is being made on Branching Out and Sweet Pea Cardigan. The latter may look finished to some, however, it is supposed to have embroidered flowers in silk ribbon. I am still waiting for the blasted ribbon! So, consider this a “before” picture and the “after” pic will be when the embroidery is done. Branching Out should look better after blocking–I hope. I am enjoying seeing the lace emerge while knitting it, and it is getting easier. I am attending a professional conference Thurs. 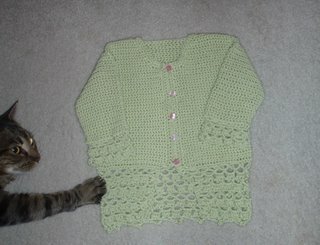 and Fri. of this week, so I will probably work on dh’s Suri Merino cardigan during the lecture parts. Fortunately, play therapists understand you are still listening even though your hands may be busy!